FOR IMMEDIATE RELEASE: Lewiston, Maine (August 12, 2016) – New England Fights (NEF) returns to Lewiston on September 10, 2016 with the fight promotion’s next event, “NEF 25: HEROES & VILLAINS.” The fight card will feature both mixed-martial-arts and professional boxing bouts. Earlier today, the fight promotion announced the first pro boxing bout signed for the event. 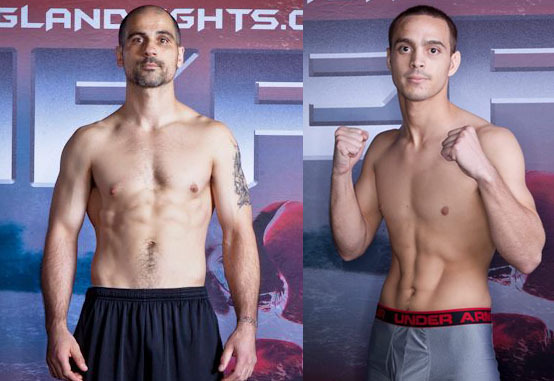 Brandon Montella (4-0, 3 KOs) will take on Tollison Lewis (2-1, 1 KO) in a four-round light-heavyweight contest. Montella graduated from Carrabec High School in North Anson, Maine in 1998. Soon after, Montella joined the United States Marine Corps (USMC). He served in the marines until 2003 when he received an honorable discharge. After spending the better part of a decade in Virginia, Montella moved with his wife to the Boston, Massachusetts area in 2011. He owns and operates The Way, LLC boxing gym in Woburn, Massachusetts. Montella has been on a tear in the boxing ring of late, scoring three knockouts in an eight-month period. Tollison Lewis cut his teeth in the NEF MMA cage. He has found more success, however, in the boxing ring. Lewis took a fight on one day’s notice against veteran John Webster (8-7-1, 6 KOs) in the fall of 2014. He would dominate that fight and win by decision. Lewis followed up that performance with a stoppage of Zenon Herrera (0-2) last year, earning himself a crack at Brandon Berry’s (11-2-1, 7 KOs) Northeast Junior Welterweight Title earlier in 2016. Lewis predicts nothing short of an all-out slugfest with Montella on September 10.